The principal aquaculture species at Aquaponics Africa is Tilapia rendalli. 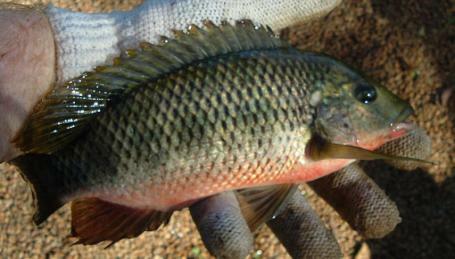 the Redbreasted Tilapia.This is a herbivorous species, native to Africa occurring between latitudes 20N-20S.It is known locally as kurper or bream and prefers warm water with temperatures of 24-32C.The South African angling record weight is 1.845kg. Can withstand poor water quality and low oxygen. Can withstand variable water temperatures. Wide diet variety of plant matter,algae,worms,detritus,commercial pellets,Lemna(duckweed) and water lettuce. Good growth rates and food conversion ratios. Good polyculture possibilities with other species. © DIY Aquaponics Manual by Ken Konschel 2013 | All Rights Reserved.